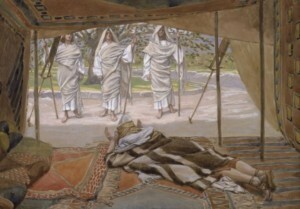 The parasha begins by telling us that Abraham was sitting at the entrance of his tent on a very hot day, and God appeared to him. As always, the question that must be asked is: why the details? The Torah could have simply said that God appeared to Abraham. Why does it mention that the day was very hot and that Abraham was sitting at the opening of his tent? The commentaries explain that this was the third day since Abraham was circumcised (which is how the last parasha concluded), and the third day is the most painful. God wished to make it a little easier on Abraham, so He made it a very hot day, forcing people to stay home. 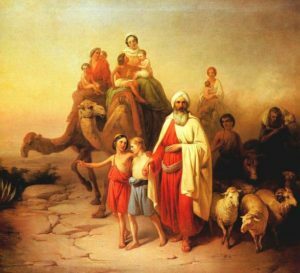 As we know, Abraham constantly entertained guests, setting up his tent at a busy intersection to meet as many people as possible. On this day, the guests were not showing up. This is why Abraham was sitting at the entrance of his tent, hoping for a visitor. The Sages explain that for Abraham the pain of not having guests was even greater than the pain of the circumcision! Suddenly, Abraham spots a trio of travelers in the distance. Despite his recent circumcision, he immediately jumps up and runs after them, begging them to take a rest at his home. Little does he know that these are angels sent by God, bringing him the news of the coming birth of Isaac. Abraham immediately springs into action, giving his visitors a place to relax, and water to wash their feet, then hurrying to make food. He asks his wife Sarah to bake various breads and cakes, while he goes off to prepare a calf. For just three visitors, Abraham took an entire calf, which would have a couple of hundred pounds of meat. Meanwhile, he asked Sarah to use three se’im of flour. A se’ah is a Biblical unit of volume that equals nearly seven and a half litres. This means that Sarah took about twenty two litres of flour – almost a hundred cups! It is beyond evident that Abraham embodied generosity and kindness. We continue to see these traits throughout the parasha. The very next scene shows Abraham “bargaining” with God in an attempt to prevent the destruction of Sodom. Though Abraham knew very well how evil Sodom was, he hoped that there was a better way than simply eliminating them; perhaps they can be brought to repentance? Once again we see why Abraham merited to be the very first Jew and patriarch: his passion to make the world a better place. Not to destroy, but to build. Not to combat the darkness, but to bring in more light. This entry was posted in Mysteries & Origins and tagged Abraham, Angels, Chessed, Circumcision, Generosity, Hospitality, Kabbalah, Kindness, Sarah, Se'ah, Sefirot, Sodom, Ten Commandments, Ten Plagues, Vayera (Parasha) on November 6, 2014 by Efraim Palvanov.